At Roselle Park Dental & Implants, we’re proud to offer a state-of-the-art environment that can recreate the missing teeth you need and restore the quality of life you deserve. Whenever possible, Dr. Oshidar’s primary goal is to save your natural teeth, but when that just can’t be done, modern dental implants can seamlessly recreate oral functionality and beauty. If you’re ready to start pursuing this worthwhile reconstructive solution, don’t hesitate to contact our Roselle Park, NJ location. Our dedicated doctors and staff members can’t wait to welcome you in! Your tooth is composed of two vital components – the white crown that shows in your smile, and the root that exists safely beneath the gum line. Traditionally, tooth replacement services have only bothered with recreating the crown of the tooth because it’s the portion that you see. However, while this improves aesthetics, the lack of a functioning tooth root has adverse consequences for the health of the patient’s jawbone. Without ongoing stimulation, the structure tends to deteriorate over time – this is why so many older patients have a “hunched” facial appearance. 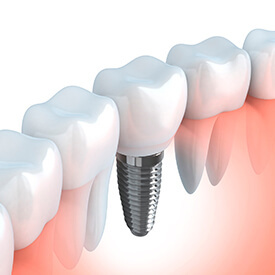 Thankfully, dental implants are designed to recreate the entire natural structure of your teeth, providing a new, functioning “root” (the implant itself) and a custom-made, highly lifelike restoration that attaches on top as the new “crown.” This results in greater bone retention, improved oral health, and exceptional stability, among other valuable, lifelong benefits. Why Is Roselle Park Dental & Implants The Right Choice For You? Here in Roselle Park, you can trust that you’re being treated by the best of the best. Dr. Oshidar is highly distinguished in the field of implant dentistry, holding exceptional distinctions (Fellowship, Mastership, and Diplomate) in several prestigious organizations, including the International Congress of Oral Implantology, International Academy of Implant Dentistry, and California Implant Institute. He utilizes cutting-edge CT scanner X-rays for comprehensive imaging and treatment planning, resulting in precise accuracy and maximized chances of success. He also regularly instructs dentists in implant dentistry and offers implant seminars right here in-office for patients! If you would like to learn more about our credentials and experience, don’t hesitate to contact us. We want you to feel fully confident about your choice to trust your smile in the hands of Roselle Park Dental & Implants.